dramatically reduce size and frequency of recessions is easy. and a simple rule for monetary policy would make matters worse. ・Science confronts theories with data. 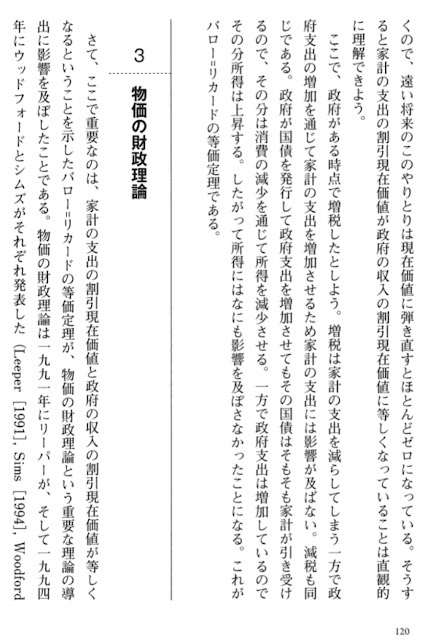 ・A nice, clean science, like physics or biology or chemistry, generates data from experiments. ・If there's not enough data to resolve an issue, a clean science runs the experiments a little longer. ・Economics is not such a science. We have to take the data that history, bit by bit, provides us. ・Since 1950, the US has had 10 recessions. Science with 10 data points. 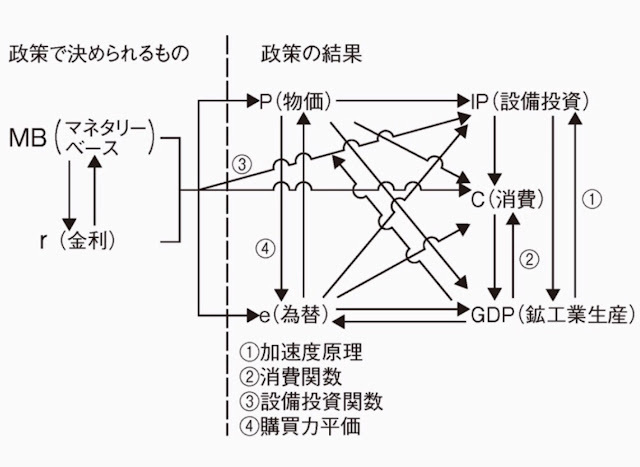 ・Understanding of the effects of monetary policy improved. 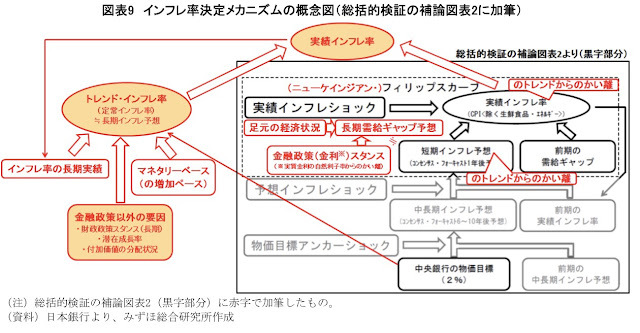 ・Understanding of how to get data to tell us something about this issue improved. Michio Hatanaka . 1975. “On the Global Identification of the Dynamic Simultaneous Equation Model with Stationary Disturbances.” International Economic Review 16:545–54. Fiscal expansion can replace ineffective monetary policy at the zero lower bound, but fiscal expansion is not the same thing as deficit finance. It requires deficits aimed at, and conditioned on, generating inflation. The deficits must be seen as financed by future inflation, not future taxes or spending cuts. V. WHY HAS MONETARY POLICY BEEN INEFFECTIVE IN THE US, EUROPE AND JAPAN? The general explanation for the low interest rates, large central bank balance sheets, and low inflation in these countries is the failure of effective fiscal expansion to take over from monetary policy as the zero lower bound was approached. Of course in these countries deficits have been large and debt-to-gdp ratios have increased. But the increased deficits have been accompanied by hand-wringing about their long-term effects on taxes and popular spending programs. In Europe, the emphasis on austerity has been explicit and widespread. The idea that the increases in debt were meant to create inflation that would partially pay for them is not part of the public discussion. In Japan, after an initial apparent move toward coordinated fiscal and monetary expansion, a substantial increase in the consumption tax was introduced before the inflation target was reached. In the US it has been less clear what philosophy guides fiscal policy, which perhaps explains its relative success in approaching its inflation target. Nonetheless it is clear that the American public isaware of the country’s long term fiscal problems and their potential impact on their own access to retirement support and medical care. The Gallup poll reports that roughly half of non-retired Americans think that its social security system will not be able to provide them with any retirement income. In this context it seems likely that many people interpret deficits as a sign of fiscal dysfunction that portends higher future taxes or reduced benefits. Changing that perception would require that policy-makers make clear that future fiscal contraction is conditional on reaching and maintaining inflation targets. VI. CAN DEFICITS REPLACE INEFFECTIVE MONETARY POLICY AT THE ZERO LOWER BOUND? The answer to this question should be mostly clear from the previous section’s discussion. Reductions in interest rates can stimulate demand only if they are accompanied by effective fiscal expansion. For example, if interest rates are pushed into negative territory, and the resources extracted from the banking system and savers by the negative rates are simply allowed to feed through the budget into reduced nominal deficits, with no anticipated tax cuts or expenditure increases, the negative rates create deflationary, not inflationary, pressure. What is required is that fiscal policy be seen as aimed at increasing the inflation rate, with monetary and fiscal policy coordinated on this objective. In Japan, this might be achieved by explicitly linking planned future increases in the consumption tax to hitting and maintaining the inflation target. In Europe it is harder to see how the necessary fiscal policy commitment could be arranged, because of the many fiscal authorities in the region. A Eurozone-wide moratorium on the Maastricht budgetary rules, to be kept in place until area-wide inflation reaches and sustains the target level, would be effective. Of course it is difficult to see how, in the Eurozone institutional framework, this could be arranged. The 1980’s in Brazil provide an example of a situation where, without any direct interference from fiscal authorities, a central bank motivated by price stabilization could have decided not to raise interest rates despite high inflation. As Loyo (2000) points out, in that period interest rate increases increased inflation. How could this be? Interest payments were a large part of the government budget. The budget process was dysfunctional, so that increases in interest rates fed through to increased issuance of government debt, accelerating the rate of expansion of the debt. No expectation of future fiscal stringency was generated by the debt expansion, so the debt expansion increased demand, and thereby inflation. 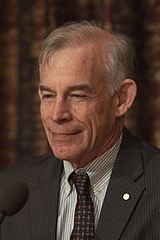 The reason standard economic models imply that interest rate increases reduce inflation isthat they assume, usually implicitly, that an increase in the interest expense component of the budget calls forth, at least eventually, an increased primary surplus — revenues minusnon-interest expenditures. This is the most easily understood restraint on fiscal policy required for central bank independence, and one most economists find quite plausible. The European Monetary Union puts limits on debt-to-gdp ratios and deficits, probably with this sort of mechanism in mind. However, this point remains valid if we reverse all the signs, and this is not so widely recognized. If in the face of low inflation the central bank lowers interest rates, demand increases and inflation rises only if the reduced interest expense component of the budget is expected eventually to flow through to a reduced primary surplus. A fiscal authority that, in the name of “fiscal responsibility”, maintains its primary surplus as the central bank cuts interest rates, undermines the effectiveness of monetary policy to the same degree, and by the same mechanism, as in the case of 1980’s Brazil. Increases in the quantity of nominal debt occur through government deficits, and, depending on the reasons for the deficit, the increase in nominal debt may change beliefs about the future fiscal backing for the debt at the same time that it affects the amount of debt outstanding. The deficit might also lead to interest rate changes through a monetary policy reaction. The fiscal theory of the price level does not, therefore, simply replace the notion that the quantity of money determines the price level with the idea that the quantity of government debt, or the sequence of nominal deficits, determines the price level. It implies that interest rate policy, tax policy, and expenditure policy, both now and as they are expected to evolve in the future, jointly determine the price level. 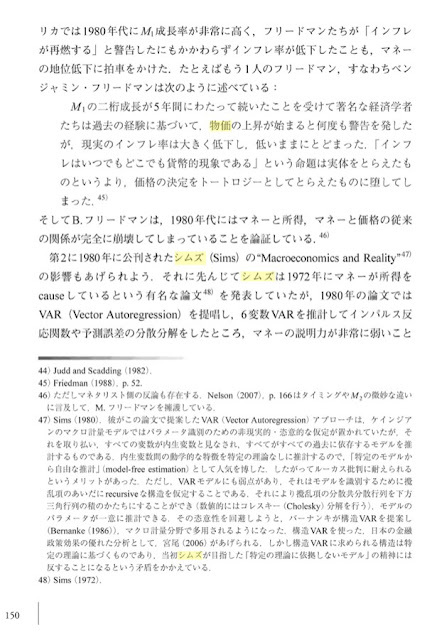 Sims(1980)彼がこの論文で提案したVAR(Vector Autoregression)アプローチは,ケンジアンのマクロ計量モデルではパラメータ識別のための非現実的・恣意的な仮定が置かれていたが,それを取り払い.すべての変数が内生変数と見なされ,すべてがすべての過去に依存するモデルを推計するものである 内生変数間の動学的な特徴を特定の理論なしに推計するので,「特定のモデルから自由な推計」(model-free estimation)として人気を博した したがってルーカス批判に耐えられるというメリットがあった. ただし,VARモデルにも弱点があり,それはモデルを識別するために攪乱項のあいだにrecursiveな構造を仮定することである それにより攪乱項の分散共分散行列を下方三角行列の積のかたちにすることができ(数値的にはコレスキー(Cholesky)分解を行う),モデルのパラメータが一意に推計できる その恣意性を回避しようと,バーナンキが構造VARを提案し(Bernake(1986)),マクロ計量分野で多用されるようになった．構造VARを使った, 日本の金融政策効果の優れた分析として,宮尾(2006)＊があげられる．しかし構造VARに求められる構造は特定の理論に基づくものであり,当初シムズが目指した「特定の理論に依拠しないモデル」の精神には反することになるという矛盾をかかえている. Sims,Christopher A. (1972)“Money lncome,and Causality", American Economic Review,Vol. 62,No 4,pp.540-552. Let me talk a bit about Sims contributions to economics, and if I have time I'll try to cover Sargent later. 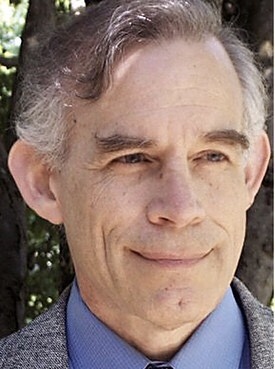 Prior to Sims work, in particular his paper "Macroeconomics and Reality," the state of the art in macroeconometrics was to use large-scale structural models. These models often involved scores or even hundreds of equations, essentially a S=D equation for every important market, identities to make sure things add up correctly, etc. But in order to estimate the parameters of these models, the structural parameters as they are known, you had to overcome the identification problem. The a's and the b's are the parameters that economists are generally interested in, but in this form it is not possible to estimate them. There must be what are known as exclusion restrictions before estimation is possible. In this case, for example, identification can be achieved by making either a1 or b1 equal to zero (more on this below), i.e. excluding one of the variables from one of the equations. If there is a reason for this, then excluding the variable is okay, but a variable can't be left out simply to achieve identification -- there must be good reason for excluding Xt from the first equation, or Yt from the second (or both). Omitting a variable that ought to be in a model in order to satisfy the identification restrictions results in a misspecified model and biased estimates. In large models, these exclusions are numerous, and many researchers simply assumed whatever exclusion restrictions were needed to achieve identification, and then went on to estimate the model. In Macroeconomics and Reality, Sims pointed out the problem with this approach. The assumptions that researchers were imposing to achieve identification had no theoretical basis. They were ad hoc and difficult to defend (especially when expectations are in the model -- expectations tend to depend upon all the variables in a model making it difficult to exclude anything from an equation involving expectations). What Sims suggested as an alternative was to drop structural modeling altogether, and to use generalized reduced forms as the basis for estimation. There would be no hope of recovering structural parameters in most cases, but there was still much that could be learned by using reduced forms instead of structural models. This is a VAR model. At first, Sims thought we could draw important conclusions from this model, e.g. 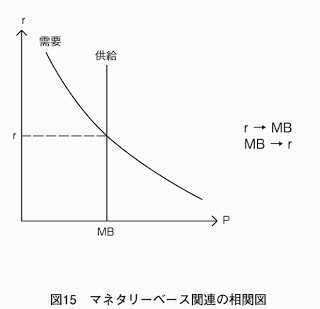 suppose that X is money and Y is output. Then this model could tell us how a shock to money would change output over time (these are called impulse response functions -- you hit the system with a shock, and then use the estimated model to trace out the path of the endogenous variables over time). We could use this model to answer important questions such as whether money causes output (Sims' technique for testing causality was essentially the same as Granger causality, but Sims' made an important contribution in extending the causality techniques to systems with three or more variables when he introduced impulse response functions and variance decompositions). この NKPC を 1 本釣りで GMM で推定．やはり backward 項が ... DSGE モデルは Lucas 批判, Sims 批判に対するモデラーからのひとつの回答とも言え，個 .... ンフレ率 に依存して決定していることが示されており，VAR の推定結果からも（cf. hitting and maintaining the inflation target. は じめに. ー 9 80年代後半以降の金融派生商品 (デリ. バティブ) 市場のめざま しい 拡大は、 市場間の. 緊密化、 取引の効率化等を飛躍的に促し、 国際. 金融市場を大き く変貌させた。 デリバティ ブ取. 引の発展に象徴される金融業におけるテクノロ. １．現在価値の求め方. ２．「シナリオ」を伴うリスク指標. （１）ＢＰＶ（ベーシス・ポイント・ バリュー）. （２）ＧＰＳ（グリッド・ポイント・センシティビティ）. （３）シナリオに基づくリスク量. 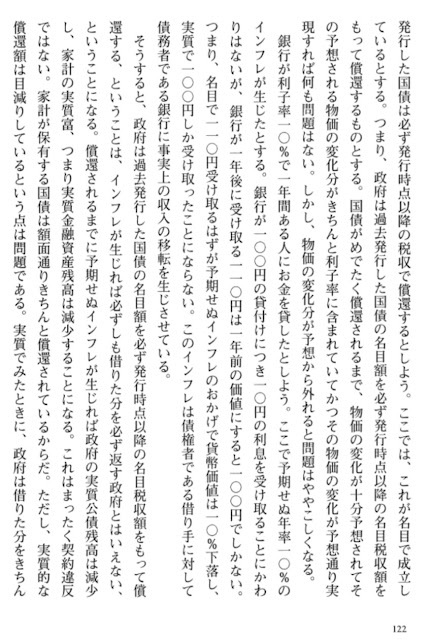 ３．「確率」を伴うリスク指標. （１）ＶａＲ（バリュー・アット・リスク）. 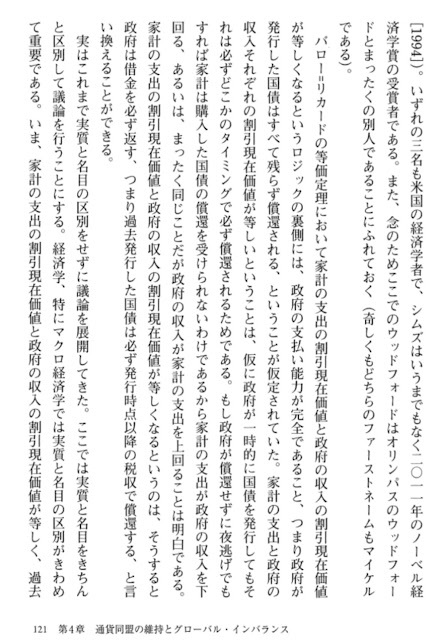 フリードマンのマネタリズムについては Friedman, M. and A Schwartz、“Money and Business Cycles," Repieto of ... 因果性テストに関する初期の文献は Sims C.、“ Money Income and Causality,"American Economic Repieto, September、1972. Sims' main contributions were, initially, the F-tests for testing causality in bivariate systems, and the addition of IRFs and VDCs to assess causality in higher order systems. In addition, he also provided many of the common "pitfalls of causality testing," -- causality testing can be misleading in a number of ways. One is above, leaving a variable out of a system. If A causes B to change tomorrow, and C to change the next day, a system containing only B and C will look as though B causes C when in fact there is no causality at all, a third variable causes both. Other pitfalls can occur, for example, when there is optimal control or when expectations of future variables are in the model. Identifying the pitfalls of the methods he (and others) developed was also an important contribution to the literature. when its supply is increased. Evidently, Xenophon’s statement is diametrically opposed to the quantity theory, and one might instead be inclined to denote him as the first anti-quantity theorist.